Backing up your data is one of the most important things you can do every single day in your business. If you know your backups are being carried out properly then this blog post isn’t for you. But if you’re not sure how your backups are managed, or if they work, then imagine for minute what state your business would be in if you lost not only your own but your clients’ critical information and documentation. How much could you recover from what was lost? Earthquakes – big ones – we know could strike at anytime and anywhere in this country, and fires and floods can take less than a minute to cause maximum damage. In a more likely scenario you’ll spill coffee over your laptop or be hit with a ransomware virus like crypto-locker. Any of these situations could see your business suffer if your backups aren’t in order. 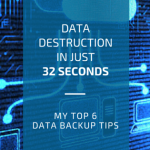 I’ve compiled a list of the top 6 things you should be doing to reduce your risk of catastrophic damage caused by neglecting to backup. Similar to having a fire warden or someone responsible for keeping insurance policies are up to date – a business needs to make sure someone is accountable for data backup and recovery. Likely this is the person who takes care of your IT. Also consider if this person is suddenly unavailable – who’s next in line? The Christchurch earthquakes hit unexpectedly. The fire that swept through this Palmerston North law firm destroyed their office (the location of their server) in just 32 seconds. Anything could happen so overdoing your backups is far better than doing the bare minimum. Backups should be performed throughout the day and ideally this is done automatically. Keep more than one copy of your backup in different locations and if possible on different devices such as an external hard drive, USB, cloud storage, or offsite server. We perform backups of our clients’ entire system every three hours. There’s no point in keeping your backups in the same location as your business’ data if the disaster that you’re preparing for happens in your office. You could take a copy of the backup home or store it in the cloud in a completely different country. Our data is backed up in both the North and South Islands but it all remains onshore in New Zealand. Backups are no good if they don’t work or you don’t know how to recover the information. You should check your backup and recovery process on a regular basis. To go one step further you should document this process so you’re covered in the event your person responsible for backup and recovery is not available. At Resolve we perform backup testing every fortnight. By the time you realise your backups aren’t done properly it’s most likely too late – so while everything is performing as expected why not send me an email to have your backup process audited. We also provide a backup service. Smart Backup will automatically save all new and modified files daily offsite, protects files with high-strength 256-bit encryption, and stores them in multiple locations across NZ for security, reliability and ease of retrieval. Backups and a reliable recovery process could be the difference between your business carrying on as usual or completely folding – when backups are so easy to do why wouldn’t you?